In two non-descript metal buildings tucked away in the industrial corridor of Noble Avenue in Farmersville is one of the nicest showrooms you will find in the Valley. Windows Plus Construction, Inc. isn’t much to look at from the outside, but just inside the glass doors is an art gallery of custom doors, windows and cabinets to fit any size, style and stain. CEO Todd Griffin’s name is now synonymous with custom construction and manufacturing throughout the Valley. His cabinets, built to fit any size area without cutting corners or wasting space, have been featured in Lifestyle Magazine layouts and trade publications. But what makes Windows Plus so unique is its commitment to serve clients building track homes down the street to mansions in some of the most elite communities in California. And all of this work is done just off Highway 198 in Farmersville, a fact not lost on the City Council. At its Oct. 12 meeting, the Farmersville City Council recognized Windows Plus in honor of National Manufacturing Month in October. “It has been a pleasure working in the city for the past 15 year. I am also glad to see construction coming back,” said Griffin. Twenty-six years ago, Griffin made the switch from crowning teeth to crown molding when he left a career in dentistry to take a summer job at a lumber yard in Visalia selling doors and windows. But when the actual doors closed on the business, a window of opportunity opened for Griffin who started his own business. Windows Plus was born as Griffin stared out his living room windows with little idea of the success his venture would bring. Griffin quickly built a reputation as a reliable supplier for both standard doors and the more custom requests from builders. When he saw a need for shower doors and mirrors, he expanded his business again, this time hiring a few employees. By 1998, he was doing commercial glass for commercial storefronts. custom doors were those installed at a wooden mansion in the Lake Tahoe area. Even more impressive is his cabinet showroom across the parking lot. There are no “dead corners” in Griffin’s designs, meaning there are no faux drawers or unused space. 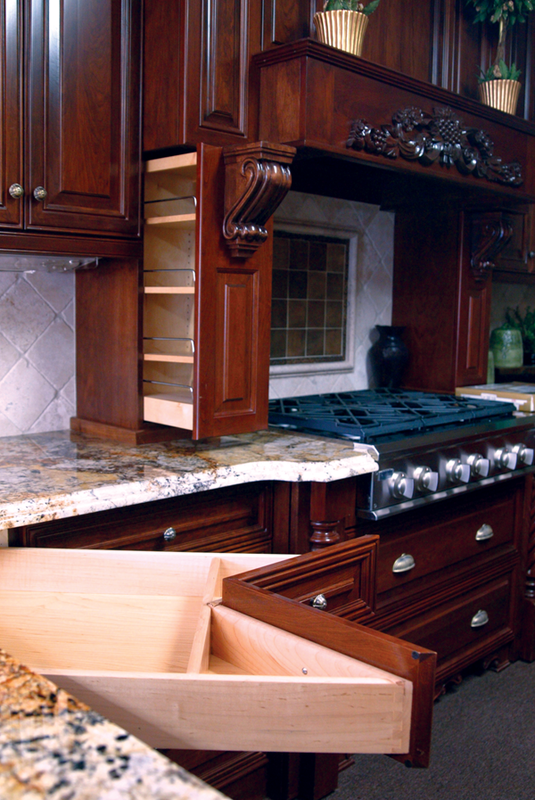 The interior framing over a stove top has hidden slide out spice racks and utensil holders. Corner drawers pull out as a single inverted triangle and everything is soft close so there is no slamming or worn out railing. These customized traits allow customers to utilize every inch of their home, especially older homes with tight spaces due to additional interior walls compared to today’s open floor plans. Griffin has manufactured nearly all of his doors, windows and cabinets from the Farmersville location since moving there 15 years ago. With 35 employees, and as many as 70 at the height of the construction boom in 2005, Griffin’s business is one of the largest employers in Farmersville. The multi-faceted business is also a family business. “The City is really easy to work with and makes it a great environment for business,” Griffin said. Griffin said he is supported by his wife, Dina, and their oldest daughter Shelby helps with the property management part of the company. The Griffins’ other daughter, Skyler, is studying construction management at Cal Poly San Luis Obispo. “She will probably join the business soon after she graduates,” Griffin said. For more information about Windows Plus Construction, Inc., call 559-738-9900, 559-799-1509 or visit www.windowspluss.com.